STATE HOUSE – Rep. Teresa Tanzi, Rep. Kathleen A. Fogarty and Rep. Carol Hagan McEntee visited the Jonnycake Center of Peace Dale this week to present a $7,500 legislative grant to support the center’s effort to provide food to those in need. “Having enough to eat is one of the most urgent needs there is for any family. 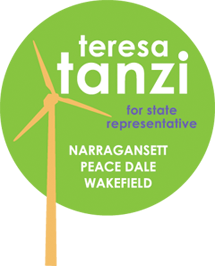 We joined forces to be able to make this a significant grant because we feel that providing food to those in need is one of the most important and worthy causes of all,” said Representative Tanzi (D-Dist. 34, South Kingstown, Narragansett). The money will be used, in part, to purchase Thanksgiving turkeys for clients at the center, which provides comprehensive assistance to those in need of food, clothing and household items and advocacy for clients. When the three representatives visited the center earlier this week to deliver the grant, they also helped pack and distribute Thanksgiving packages to clients. “We made a commitment to provide a turkey to every one of our clients this year. This generous grant goes a long way to help us honor that commitment,” said Kate Brewster, the center’s executive director. The legislators reminded their constituents that the economic recovery is slowest for their poorest neighbors, and the Jonnycake Center of Peace Dale needs their generosity over the holiday season. In particular, the need for breakfast and lunch items increases as schools are on holiday break and children are no longer able to get those meals at school. The Jonnycake Center of Peace Dale is located at 1231 Kingstown Road and can be reached at (401) 789-1559 or info@jonnycakecenter.org. More information is available on the center’s website, www.jonnycakecenter.org. In photo, from left, Jonnycake Center of Peace Dale Deputy Director/Development Office Lisa Wright, Rep. Teresa Tanzi and her daughter Delia Tanzi Buchbaum, Jonnycake Center Food Pantry Coordinator David Olguin, Rep. Carol Hagan McEntee, Rep. Kathleen A. Fogarty and Jonnycake Center Executive Director Kate Brewster.